Going on a pilgrimage has a long tradition. There are probably only very few countries without one or the other pilgrimage trail. SalzburgerLand even has a variety to choose from! Even the famous St James’s Way leads hikers through Salzburg on their way to Santiago de Compostela. The term pilgrimage is derived from the Latin word peregrinus, which means as much as to be in a foreign country. A pilgrim was therefore a person who went to a foreign country for religious reasons and made a journey to a place of worship for that mission. A pilgrim could be recognised due to the traditional attire and equipment. This consisted of the pilgrim’s hat, staff, horn and coat, water bottle and pilgrim’s bag. The wide-brimmed felt hat protected both from sun and rain. St James’s Way pilgrims often used a hollowed, dried out gourd as a water bottle. The pilgrim’s staff served as a walking stick and was therefore considered as a third foot to help the pilgrim during the journey. Although this equipment seems outdated today, the right clothes, good shoes and a water bottle are indispensable items still today. Going on a pilgrimage can be for different reasons: an (self)imposed penance, the fulfilment of a vow, because of gratitude or just to deepen beliefs. For whatever reason – then and now – that people embark on a pilgrimage, one fact is for sure: it gives you a lot of time to think about yourself, life, and things that matter! A pilgrimage could be a turning point in life, or in any case, a return to simple truths and values. Nine significant pilgrimage and long-distance hiking trails have gained more and more importance for tourists in recent years. A pilgrimage holiday is not necessarily only relaxing. On the contrary, the hikes each day can be quite demanding – walking in burning sunshine or pouring rain, sore feet and tired legs can be daily challenges. And then, while you’re out in nature, within the stillness and calm, thoughts might sneak up on you that you may have suppressed for years and you cannot escape from any longer. At the end of the day, you will probably have shifted a thought or outlook, come to a significant conclusion or become a different person in one way or another. At the behest of Charles the Great, the Pope made Bishop Arno of Salzburg an archbishop in 798. Arno was the first Archbishop of Salzburg and the pilgrimage trail is named after him. The Arnoweg trail is a circular route that leads to significant places in church history. On the way, the pilgrim passes numerous scenic and cultural-historical highlights of SalzburgerLand. Besides impressive pilgrimage churches, the famous Krimml Waterfalls is located en route. The literal peak of the pilgrimage tour is the Zittelhaus hut on Sonnblick mountain at an altitude of 3,106 m.
The Via Nova, as the name suggests, is a new pilgrimage trail. The first section of this European trail was opened in 2004 and the route is constantly being expanded. The last or first section runs through SalzburgerLand. From Michaelbeuern Abbey you walk to Mattsee collegiate church, through the Salzburg Lake District right to Wolfgangsee lake. Even today, pilgrims freshen up at the late Gothic pilgrim fountain in front of the pilgrimage church of St Wolfgang. The Salzburg part of the most famous pilgrimage trail leads from Frankenmarkt in Upper Austria to Pass Strub, where the trail becomes the Tyrolean St James’s Way. The trail through the Salzburg Lake District is just under 100 kilometres long and takes pilgrims past the pilgrimage church of Maria Plain, through Salzburg city and via Unken and Lofer to Pass Strub. The yellow Cross of St Rupert on a purple background points the way for pilgrims on the approximately 250 kilometre route from Altötting to Gut Aich Priory in St Gilgen at Wolfgangsee and finally to Bischofshofen. A good level of fitness is required to hike around five to six days e.g. from Gut Aich Priory across Postalm, through Lammertal valley and Hochgründeck mountain to Bischofshofen. The path got its name from Bishop Rupert of Salzburg, who in 650 AD made it his mission to revive Christianity in present-day Bavaria and SalzburgerLand. St Leonhard near Tamsweg was already a pilgrimage destination in the early 15th century. With time, the importance of this special, spiritual place was forgotten. The Leonhardsweg pilgrimage trail that leads from Salzburg Cathedral to Leonhardskirche church has put Tamsweg as a place of pilgrimage on the map again. 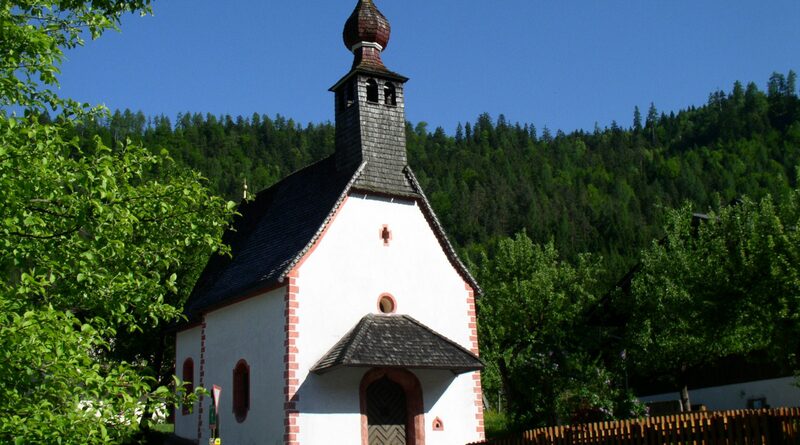 Many pilgrimage churches in the Pinzgau region are dedicated to the Virgin Mary. The Pinzgauer Marienweg pilgrimage trail connects them all and leads through the entire region. Depending on your wishes and level of fitness, the trail can be hiked in four different ways. The traditional way in six daily stages takes you through the Keltendorf Celtic village in Uttendorf and the Einsiedelei hermitage in Saalfelden and ends at the Maria Kirchental pilgrimage church near Lofer. A shorter version of the trail leads from Zell am See to Maishofen. The demanding rail runs across Römersattel and through the Stuhlfelden mountains and valleys via Saalbach to Hochfilzen. The way that Saint Wolfgang, Bishop of Regensburg, walked to his hermitage on Wolfgangsee lake has still not lost its appeal and masses of pilgrims have followed since the Middle Ages. The pilgrimage begins at the grave of St Wolfgang in Regensburg. From there it runs past memorials and places of influence to St Wolfgang. The special thing about it: you can also make this pilgrimage by bike! All roads lead to Mariazell – at least there is a path from all Austrian provinces that leads to the famous pilgrimage site of Mariazell in Styria. The place was first mentioned in 1266, in 1907 the church was elevated to a “basilica minor” by Pope Pius X. From Salzburg, the trail goes past Gaisberg mountain to the Salzkammergut region and ends in the Upper Austrian Mariazellerweg trail. And SalzburgerLand has another very special pilgrimage trail: the Weg des Buches, a historically interesting trail that passes through the Lungau region in Salzburg. Pilgrims follow the secret paths of the Bible smugglers and secret Protestants during the time of the Counter-Reformation. The route leads from Schärding on the Bavarian border across the Salzkammergut area, Dachstein mountain and the Carinthian Nockberge mountains to the Slovenian-Italian border. From late May to early October, you can book the package “Pilgrimage at Hochkönig“. Tip: You can order the brochure “Pilgrimage Paths in SalzburgerLand” free of charge right here.